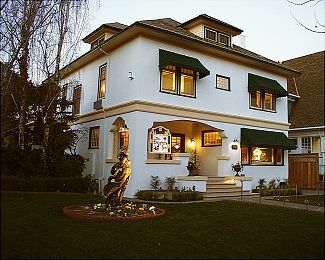 Daughter's Inn is a sophisticated landmark mansion located in Old Town Napa, in the heart of wine country California. The mansion is situated within walking distance of gourmet restaurants, the Opera House and shopping, and boasts a comfortable living room where guests can relax in front of a majestic fireplace while staying in one of the 10 exquisite guest rooms. Each guest room includes their own jacuzzi tub for two, fireplace, complimentary bath amenities and bottled water & a chocolate treat for your sweet tooth. Your room may even have a private deck or balcony, set among the trees or underneath! Breakfast, of course, is included. You'll enjoy a whole buffet of homemade goodies. Room rates range from $230 to $295, Visa and Mastercard accepted. Check in time is between 3:30 and 6:30 p.m., unless previously arranged with innkeepers. Hosted by Brooke & Perry Peterson, daughter and son-in-law of the Beazley House innkeepers. 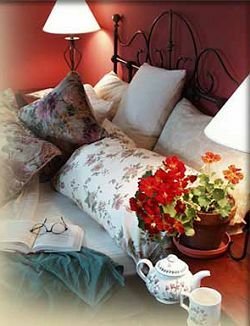 This and other Napa area Bed and Breakfast Inns can be found here online in The Register.